How We Farm - Pure Island Beef Co. THE VALUES WE FARM BY HERE AT PURE ISLAND . . .
Value#1: We raise our cattle with care. Both our grass fed and grain fed cattle are raised under free-range conditions whenever seasons permit. Our abundant pasture lands grow many species of native plants with limestone bedrock never far away. It's a combination that has earned Manitoulin a century-long reputation for exceptional livestock. 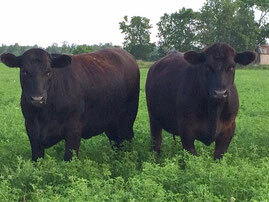 These two exceptional Black Angus animals are from our herd grazing on the regrowth of an alfalfa hay field. We also provide free-choice access to shelter when our cattle aren't grazing. You can enjoy Pure Island beef guilt-free. Our cattle are happy. Value#2: 100% Manitoulin Island raised, hormone-free. 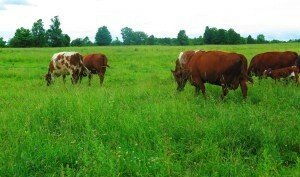 We raise all our own cattle on Manitoulin Island from birth to finished weight on local feed. This lets us make sure everything is done right. All Pure Island grass fed and grain fed beef cattle are always raised without hormones, growth implants, sub-therapeutic antibiotics and medicated feeds. All our grass fed beef is raised on a forage-based diet that includes nutritious pastures and high-quality haylage. Pure Island grain fed beef gets at least 100 days on a diet rich in locally-grown grains for optimum marbling and finish. Our grass fed beef is aged for 30 days (unique for this kind of beef) and a full 60 days for our extreme-aged grain fed beef. Aging is absolutely key for maximum tenderness and rich beef flavour. It's easy to taste the difference. Value#4: Customers are part of the family. We succeed only if people understand what we're all about. And this only happens because people love eating our beef and have confidence in how it’s raised. That’s why we meticulously follow careful farming practices, we meet predictable delivery schedules and we sell a quality of beef you won't find anywhere else. 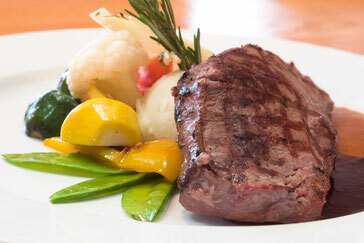 We’re proud to serve any Pure Island beef to valued guests in our home. You'll feel the same way serving our beef at your table.